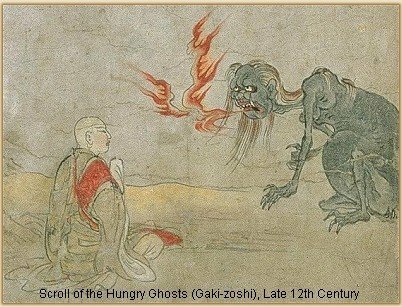 I’ve been somewhat haunted by the notion (or perhaps concept, or metaphor) of the hungry ghost since the early 1990s, when I learned about them during a time that I had some significant exposure to Buddhism through a community of writers I joined. Hungry ghosts, according to my own limited understanding, are mythical creatures characterized by an emaciated body with a huge and empty belly, combined with narrow necks and tiny mouths. The result is that they are hungry all the time, yet it’s almost impossible for them to feed themselves, or even to be fed by others who care for them, because the passage is so constricted. This image keeps coming back to me because it symbolizes so dramatically in a physical way the emotional condition of our time: profound hunger for love and connection that cannot be satisfied because we have been trained in isolation to such a degree that most of us cannot receive sufficient love, even when it’s offered. Recently, I’ve been plagued, again, by the tragic nature of this pervasive condition. Caring for the hungry ghosts, wanting to find a way – personally and collectively – to leave no one behind, has been one of the consistent motivating factors in my continual efforts to do my work. Although I believe that just about any of us has some degree of this affliction, some people, for reasons we may never know, are so extreme in their insistence on being given what they cannot receive, that they become self-fulfilling prophecies: every community they join eventually discards them; every relationship anyone enters with them eventually ends; and they remain isolated and in extreme agony, often without understanding why. If they happen to be people in positions of power, they may be surrounded by people who do what they want and say “yes” to their requests and demands, and yet their experience doesn’t become better, because they know it’s done without really wanting. Since I am in essence working for the possibility of a world where everyone matters, the hungry ghosts are of paramount importance to me. The other day, being particularly agonizing over one such person, someone I care deeply about and have enormous tenderness for, and yet do not know how to support at all, I put the question forth to a friend who is somewhat of a Buddhist scholar. “The hungry ghosts,” I said, “how are we ever going to get into a future that works for all people if we cannot find a way to generate sufficient love for the hungry ghosts to be able to receive it and heal? Today, on my weekly walk with my one friend with whom I talk theology (funny, given I live in a god-less world), I brought up with her the startling response I got from my Buddhist friend: “According to Buddhism there will never be a future that works for all people. There is radical acceptance there of the suffering inherent in the lives of humans, animals, hungry ghosts, etc…” I wanted to talk with my friend about this because, although she is a practicing Christian who does preaching, and I am a non-practicing Jew who doesn’t believe in any god, we nonetheless have a compatible theology. I thought, given this unique conjoining of the Buddhist, the Christian, and the Jewish, and with the lens of nonviolence shining light on our conversation, we will get somewhere. And we did. In this writing, I am doing what humans do: putting imposed order on flow to make it sensible to others. The conversation itself, like life, was chaotic and associative. I wouldn’t know how to convey that. It mattered that it was like that, because, like life itself, this flow was intrinsically nourishing. Some years ago, as I was starting to imagine my way into attempting to support social transformation after decades of living without much hope for anything better being possible, I did a massive piece of inner work to integrate and accept the brutal reality that I was most likely going to die in a world not significantly different, certainly not significantly better, than the world in which I was living at the time. I can’t say I am fully there, perhaps not even as integrated as I was when I did this work, because I have not re-visited this unsettling clarity repeatedly, as I now realize I must in order to maintain my sense of peace. I do know that even as a conceptual clarity without full emotional integration, this awareness serves as an antidote to urgency and anger. I know without any shred of doubt that my contribution will be forever more useful to the extent I can shift from being motivated by the desire to see results, however deeply life-affirming the results are that I want to see. Dependence on results cannot but compromise my power. The passion for that luminous vision of a world that truly works for all, including the suffering, the children, the outcasts, even those who have no capacity to contain their violent outbursts, is a key source of fuel in my heart. It informs everything I do, both personally and globally. The details of that golden future are clear and vivid in my mind and heart. I see them behind every failed interaction between people, around the corner from every act of violence, underneath every war. Sometimes what’s most painful for me is the conviction I have of just how simple it would be – to produce and transport enough to satisfy everyone’s basic needs; to make all the decisions necessary, at all levels, to create a flow of resources that works; to work out the inevitable conflicts that arise; to restore feedback loops to human and natural systems. I even trust deeply that IF we ever manage to jump-start ourselves out of the mess we have created here in the last several thousand years there would be fewer and fewer “difficult” people. When the fundamental sense that we matter is built into the very fabric of parenting, social structures, and human relationships, one of the root causes of violence disappears. The “if” in the previous paragraph is huge. I have lived with the ongoing crushing reality that there is absolutely no guarantee that we can create that world. The obstacles, both external and internal, are astronomical. Even if we all mobilize, whoever “we all” is, we don’t know if we will succeed, if nothing else because we may indeed be at the point of no return with regards to climate change, as well as several other exponential processes that are at the takeoff point and threatening to destroy our life support systems. Are there also, as my Buddhist friend so gently suggested, inherent limitations? I personally find it exceedingly difficult to believe, especially knowing that cultures without violence have always existed; that some cultures are more or less joyous; that children, before socialization, more often than not are simply happy to be alive, without any reflection or cause. Somehow, though, this conversation, this reflection, brought home the point that there’s really no way of knowing. I love the ground of humility as the foundation for action. I don’t know, and I will still act, because my passion and my conviction are sufficient. Because I am called to do so from my cells. Because I also don’t know that we can’t any more than I know that we can. So what about the hungry ghosts, then? That question lingers, symbolic, insistent, poignant. My friend the Christian now invokes God, which isn’t satisfying initially. Like I said, there is no god in my life. I do, however, palpably sense the existence of non-material reality. I have no name or shape for it, no idea what it is, how it operates, whether there’s an “it” at all. I only know and sense mystery. I have partially recovered from the mechanical and scientific reductionism I grew up on, the result of a few centuries of European “Enlightenment”. So, when she talks about there being love that doesn’t have to come from one person, certainly not from me personally, I have no difficulty. Almost. I still find I must reiterate what she already knows: that I am open, truly open, to whatever this mystery might be, except for the possibility that there is a god there who punishes, who checks and monitors each person’s actions and delivers consequences, and who receives individual requests through prayers and decides who will get what. I cannot get behind this image. In the context of this conversation, it was particularly meaningful, revelatory, I would say, that my friend immediately said this kind of god would not be nonviolent. Yes, I have long known, ever since I heard from Marshall Rosenberg in the early days of studying Nonviolent Communication, that the whole form of thinking that revolves around the concept of “deserve” is at odds with a nonviolent consciousness. I just hadn’t made the amazing leap that even if it’s a god who decides, this category of “deserve” still contributes to separation, to the very essence of what maintains violence on this one sad and beautiful planet. She recounted stories from the Christian Scriptures, where love came unannounced and created miracles. That helped us both remember the many unexpected ways in which our work, our presence, our willingness to put our actions in the service of what we hold dear, created unexpected results. Just days ago I heard from a dear friend and former student in Japan, who shared with me how one phone call that I had with him in 2008, in which he found the courage to take the leap and come for a yearlong training in the US, was pivotal for a journey that now has him and several other people traveling in Japan and sharing Nonviolent Communication on a visible scale. Then I remembered a former student from the days when I was a teaching assistant at UC Berkeley. This was a young man who was skeptical and cynical about what sociology had to offer. Tall, blond, the kind of man the world tends to open doors to, he sat in class without engaging. Then, two or three years later, he came to visit, and told me just how much what transpired in those classes ultimately helped him confront himself, and the transformation that took him on a journey of service. Magic happens. We just can’t predict or control it. That is simply not given to us. Yes, I can totally accept there is a source of love, operating by a kind of grace whose nature is simply unknowable to me. I’ve seen it, felt it. I’ve been on its receiving end countless times. I don’t have to understand, and not everything is my responsibility. Maybe that grace, that love, will reach the person I was agonizing about, maybe not. Maybe it is something I did or will do, maybe not. Maybe it’s possible to create a world that works for all, maybe not. Not knowing, the exacting humility of it, requires me only to be truthful, to follow what makes sense to my heart and mind, without knowing, without any assurance from anywhere, without a god to soothe my doubts and despair. Not because it will get results. Only because I am part of that great unfolding of mystery, and I am called to do my part, in this one small, equally mysterious, organism that I occupy while alive. This entry was posted in Uncategorized and tagged Buddhism, grace, hungry ghosts on January 10 / 2013 by Miki. "Yes, I can totally accept there is a source of love, operating by a kind of grace whose nature is simply unknowable to me. I’ve seen it, felt it. I’ve been on its receiving end countless times." Not sure I am fully understanding although I may have a glimpse of it.. are you saying when someone who might see God at one level as a god who punishes,monitors actions, delivers consequences allows the thought "what could God (Truth,Love) really be?" to really settle and be digested,then they experience,in effect a truth, love, peace,well being? While on Earth, we have opportunities to contribute here. We can find comfort in knowing that we put our best efforts into creating a more wonderful world for all. Miki, I appreciate your intentions and efforts to contribute. It's beautiful to be a part of in the present, and wonderful things could happen in the future. It will be interesting to find out. More things I want to comment on! Thank you Jean for the above exploring. I read the above as "tried to truth or love", before doing a double take and seeing what you had in fact written. Aha! Tried vs. Tied. Christians say that God is the ultimate Being, a person, but not a human being. They say that He is not a material being, but is a Spirit Being. They attribute three eternal characteristics to God: 1) that He is present everywhere 2) that He knows everything there is to know, and 3) that He is all powerful. Christians say that He is more alive than anything else in the universe, that He is better than us and always right. They say that His ways are better than our ways and that they are always the right ways. They say that His thoughts are higher than ours and that they also are always the right, true thoughts. They say that His love is higher and deeper than ours and is always the right kind of love. We say that unlike humans, He knows the thoughts, intents, and motivations of everyone’s thoughts. He knows everyone’s situation intimately, that He experiences every experience and emotion of every human being. This gives Him the rightness to be the Just Judge of all Mankind. Christians also say that He loves everyone. They say that God wants us to know Him, to come close to Him, and to take part in Him. We can share in his ways, and thoughts, and love. Christians say that He is there, close to everyone and that He is not silent. He has communicated with us, His creation, in the past and still wants to communicate with every individual. He draws us to Him in order for us to know Him.